Most of the Remote control systems use TSOP 1738 IR Sensor module to control various functions. 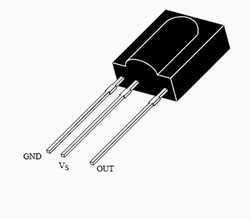 This IR Sensor is highly sensitive and may damage easily, if is supply voltage increases above 6 volts. This tester is useful to check the working of the IR Sensor. It gives audio-visual indications when the IR sensor is working properly.